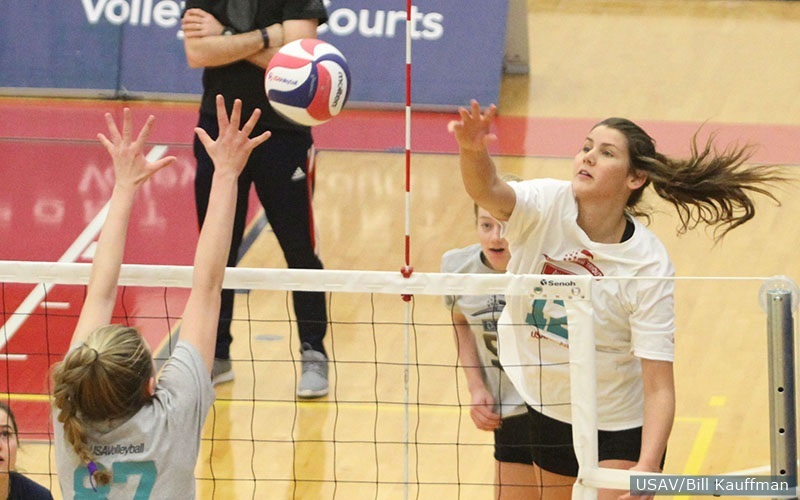 COLORADO SPRINGS, Colorado, April 2, 2019 – USA Volleyball is proud to announce its 28-player U.S. Women’s Collegiate National Team – Anaheim roster comprised of current collegiate players. Setters named to the CNT-Anaheim are Teana Adams-Kaonohi (Kansas State University, Honolulu, Hawaii), Madelyn Cole (Creighton University, Dallas, Texas), Meghan Donovan (University of Georgia, St. Louis, Missouri) and Ella Powell(University of Washington, Fayetteville, Arkansas). The liberos are Hana Lishman (Pepperdine University, Kailua, Hawaii), Kelsey Miller (University of Virginia, Crestwood, Kentucky), Emma Smith (California-Berkeley, Manhattan Beach, California) and Rachel Whipple (University of Colorado, Centennial, Colorado). The four opposites selected are Melissa Evans (North Carolina State University, Lone Tree, Colorado), Bailee Huizenga(California-Berkeley, Temecula, California), Brooke Kanas (Texas Tech, New Braunfels, Texas) and Gloria Mutiri (Kansas State University, Sand Springs, Oklahoma).